One nice feature of screenwriting software is how it can aid in tracking scenes – allowing scene-specific text, providing scene reports and even providing the option to print scene cards. Scene cards allow you to look at the flow of the story, reorder, remove and find gaps. I have typically used hand-written index cards because sometimes the scene information that is automatically included in the software card isn’t clear enough (and usually I didn’t manually enter enough information to be helpful). I’m sure that all roles involved in film rely on the scene cards a lot, but I am focusing on the writer. This writing tool would likely be useful for playwrights and novelists, as well. Recently, I started using this tool again for my current rewrite. 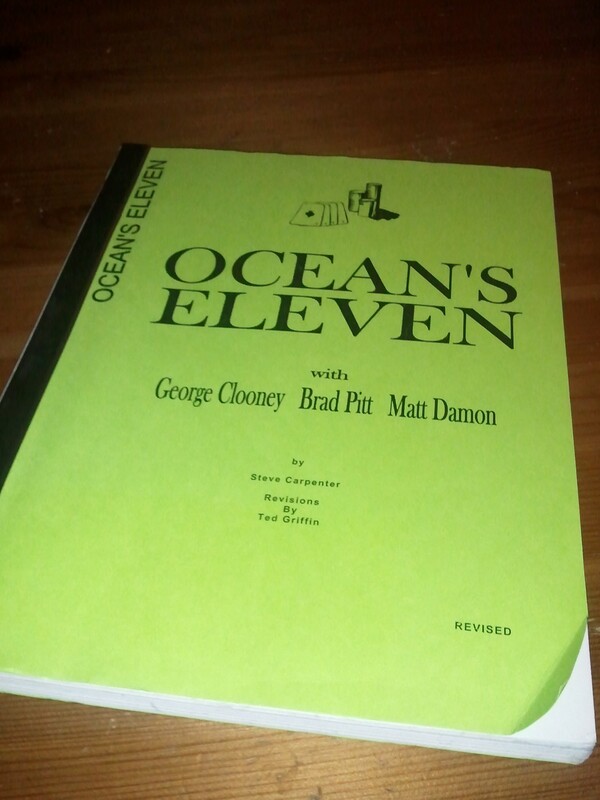 First, I ran through my script and marked all of the scenes and numbered them. 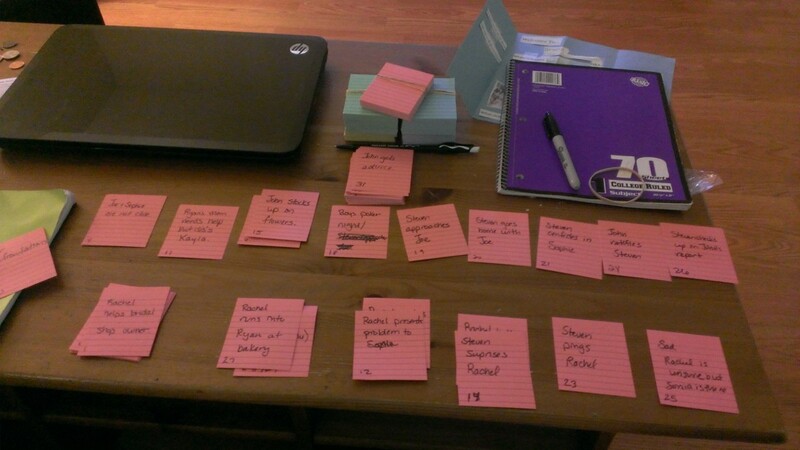 Second, I made a card for each scene, then grouped them by storyline. This was hard at times because most of my storylines are fairly intertwined. Next, I marked each with a ‘-‘ or ‘+’ for the change in the main character (of the storyline) energy/emotion charge of the scene. If there wasn’t one, I marked an ‘o’ – knowing I’d probably need to remove, change or replace the scene. Later, I took advantage of the large tables at the community center, where my daughter is taking a class, to lay out the storyline cards. I made storyline “header” cards, in green. I then faked a timeline, and spaced the cards according to time passing. This exercise helped locate several issues and opportunities for different flow. As I walked through the sequence, I started eliminating cards, marking some for edits, and putting in new placeholder cards (yellow). To preserve the timeline, I made purple cards to demarcate time (Day 1, Day 2, Week later, etc), and then stacked the whole story up in the new order. On the back, I noted the new order number. 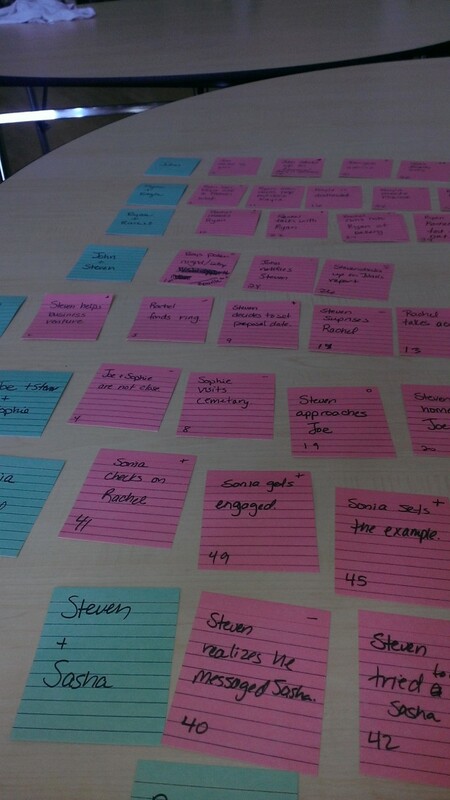 Today, I’m now using the cards to make modifications in Final Draft. Some scenes are just placeholders, to be written after the restructuring. After I do the writing edits, I’ll do an overall analysis and check the state of the rewrite. I recommend this exercise, it’s been very useful. Once I sit down and get situated back into my story, I can easily stay lost in its world for a couple of hours. Getting started can often be the toughest part. 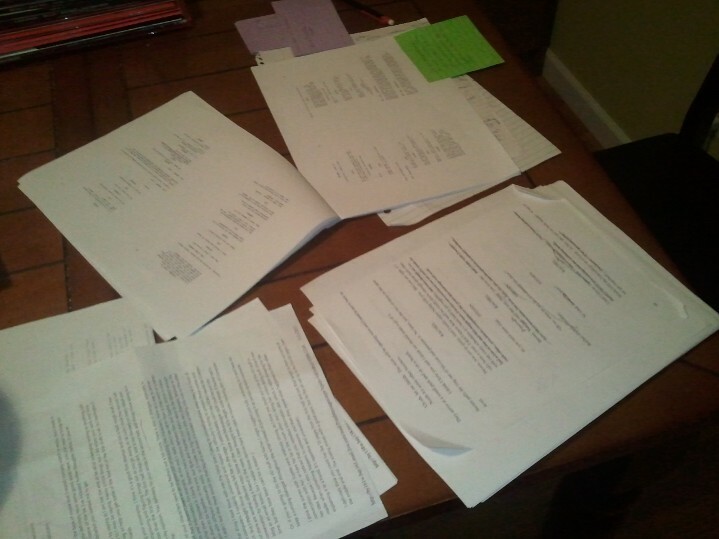 I’ve allowed the rewrite to take residence on part of the dining table. Note the lack of a computer here. I’m living in my story in hardcopy and pencils. I had already done three full scrubs on the scenes/sequences and dialogue, based on coverage I received in the Blue Cat Screenwriting Competition. I also revisited the outline I had assembled in completing the first draft, to look for holes after deciding to somewhat majorly change the ending. Now, I’m doing a couple of things at once. I am able to find tweaks to make to the dialogue with every read, so I’m doing that, again. I am also indexing the scenes manually – I realize I could do this from Final Draft, but I am comfortable with using purple index cards for sequencing, capturing thoughts, checking attributes, etc. I want to actually draw small story board pictures on the back and try to visualize the full story, end-to-end, on my table or wall. The comfort with physical cards comes from my project management background where we use them for feature lists and breakdown, prioritizing, etc. I’m also writing down little “ah-ha”s on the green sticky notes; these are thoughts that tie back to the seminar content where I didn’t have an answer for my story, or, where the story might be missing something. Funny note on the purple index cards: despite having stacks of white index cards at home – given my obsession with them – I went out and bought colored cards. I refused to use white after McKee scolded everyone writing on white paper! I mentioned last post that I have driving factors. I have three dates close together, by which to finish it by, but I’m trying not to rush too much in this process. I like that I have about 3 weeks to get it to a full version 2.0. One, I owe an update from version 1, to a producer that is possibly interested; two, I want it ready for the Great American Pitchfest; and 3, the Final Draft contest deadlines are approaching and I’m considering submitting if nothing comes through 1 or 2! Welcome to my journey in learning the craft of screenwriting. See my About page for more background. Here we go!